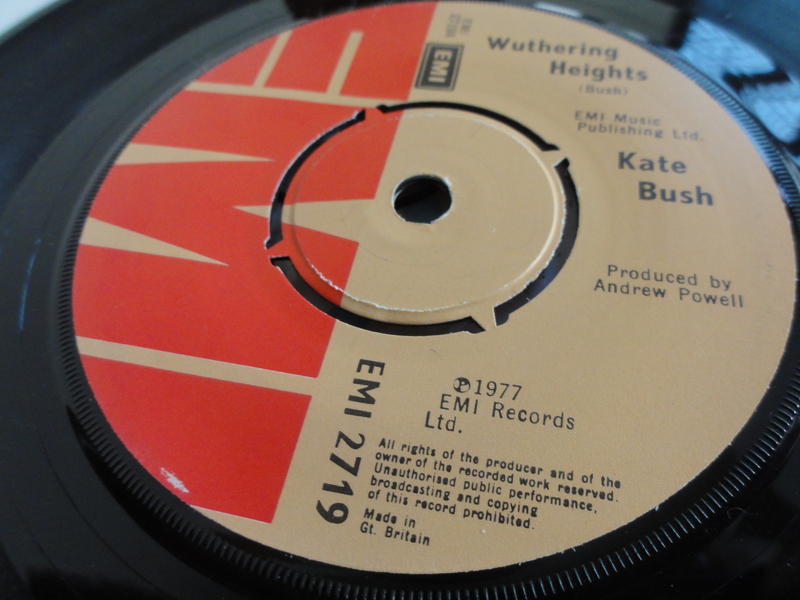 To mark the momentous return of Kate Bush as a live performer at the Eventim Apollo and my miserable failure to get tickets for any of her shows, I here take a fascinating trawl through seven of her highly collectable 7″ singles from my private stash of classic 45s (and beyond), all of which showcase her searching and imaginative artistry to excellent effect. Want the lowdown on the image adorning the centre label of ‘Babooshka’? An informed opinion on the B-side to ‘Breathing’? Look no further! 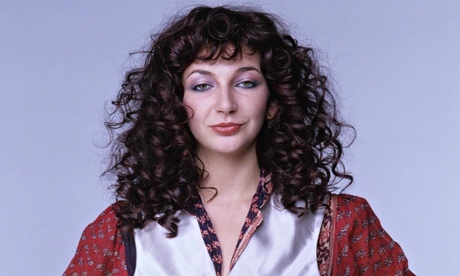 Kate Bush has of course come to be recognised as the ultimate ‘album artist’, with her liking for suites, song cycles and suchlike, and yet, with a track like ‘Wow’, she established early on that she is also a forger of highly distinctive and original singles that stand on their own merits. ‘Wow’ appears to take as its unusual subject the trials of struggling and faintly ridiculous thespians on the stage, with the sample lyric: ‘When the actor reaches his death / You know it’s not for real / He just holds his breath’. But, in actual fact, the song is a satire on showbusiness in general, being especially notable for the way Kate belts out the ironic line ‘wow wow wow WOW, unbelieeeevAble’ in the high-pitched and fluttering vocal style that was her trademark. This helped the single go all the way to number 14 in the UK singles chart in April ’79, where it held sway with a lot of songs on the more usual subject of disco dancing, with Nile Rodgers particularly reigning supreme as the co-creator of Chic’s ‘I Want Your Love’ and Sister Sledge’s ‘He’s the Greatest Dancer’. ‘Wow’ couldn’t possibly compete, however, with Art Garfunkel’s rabbit-themed number-one smash at the time, ‘Bright Eyes’ (which, I must admit, at age 6, I much preferred!). I found a copy of the regular UK pressing of ‘Wow’, backed with ‘Fullhouse’ from the Lionheart album, at a record stall in Hay-on-Wye many years ago, which is now worth in the region of…ooooh, let’s see [scratches head], £3 or £4. But even MORE valuable, because much rarer, is the Canadian promo single version, pressed on transparent yellow vinyl – which I don’t have. It’s worth about 40 notes! 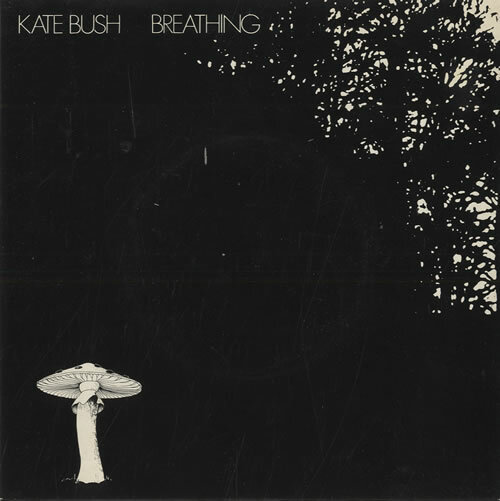 ‘Breathing’ is very probably my favourite Kate Bush single, which I love because of its sheer progginess and very heavy theme of a foetus being aware of a nuclear fallout. The Cold War-influenced track marked a big leap forward for Kate from her earlier piano-based songs, being significantly influenced by progressive-rock allies Peter Gabriel and Pink Floyd. Kate herself has said that she sat down to write a Pink Floyd song, in which mode she made effective use of a Fairlight CMI synthesiser, a heavy-guitar climax, and some post-apocalyptic imagery: ‘After the blast / chips of plutonium are twinkling in every lung’. She also added a spoken-word section that wouldn’t sound out of place on The Wall, though here it is seemingly a newsreader describing the impact of a nuclear bomb: ‘After the flash a fireball can be seen to rise, sucking up under it the debris, dust and living things around the area of the explosion’. While such downbeat ‘lyrics’ were almost certainly not reproduced in Smash Hits magazine, they didn’t hinder the song from getting to an impressive number 16 in the UK chart, sandwiched between the Average White Band’s funky ‘Let’s Go Round Again’ and David Essex’s motor-racing-themed ‘Silver Dream Machine’, as unlikely as it may seem. The gloomy cover artwork to ‘Breathing’ alludes to the mushroom cloud associated with nuclear fallout, while the disc itself is a lot of fun, featuring myriad black-clad Kate Bushes spinning around in the centre, giving the impression of a mutant spider. It is also the first of her singles to feature a non-album B-side, in the form of ‘The Empty Bullring’, this being a brief hark back to her tinkly-piano style of songwriting, on the subject of a matador trying to prove his worth, which is actually rather good. This is obviously a landmark single in the history of rock, made all the more essential because of the fantastic gothic-style artwork on the gatefold sleeve. It was originally called ‘A Deal with God’, but Kate was pressured by EMI to change the title so as not to offend people of a religious persuasion. The central concept stayed in tact, however: how a man and woman can only truly understand each other if they switch places for a while. 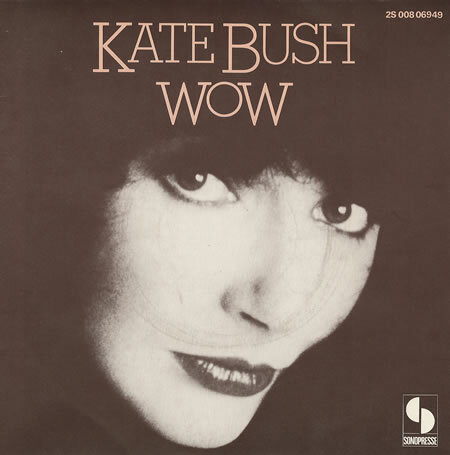 This was completely lost on me in 1985, of course, but the single was nevertheless the first by Kate Bush that I took notice of, due to my elder brother bringing home the 12″ version after sixth-form college one evening. At this time, I had the notion that Kate was some kind of Shirley Bassey-type figure who appealed to middle-aged folks, wondering what the hell my Ultravox-loving brother was playing at! But I soon realised that he was of sound mind. And the single, dominated by its thunderous drums, obviously won her a whole new generation of fans, going on to become her most successful single of the 80s, reaching number 3. Its B-side, ‘Under the Ivy’, is furthermore a non-album track that is absolutely essential – a very powerful song about the fear of revealing one’s secret self, which many perceive as being autobiographical. While I consider the gatefold single of ‘Running up that Hill’ to be a wonderful item, I feel foolish not to have attained the special 10″ picture-disc version that was released for Record Store Day in 2013 (and limited to 2,500 copies), featuring the special remix of the song that was premiered during the closing ceremony of the 2012 Olympic Games. This also features the original recording of ‘Walk Straight Down The Middle’, which appeared on The Sensual World. 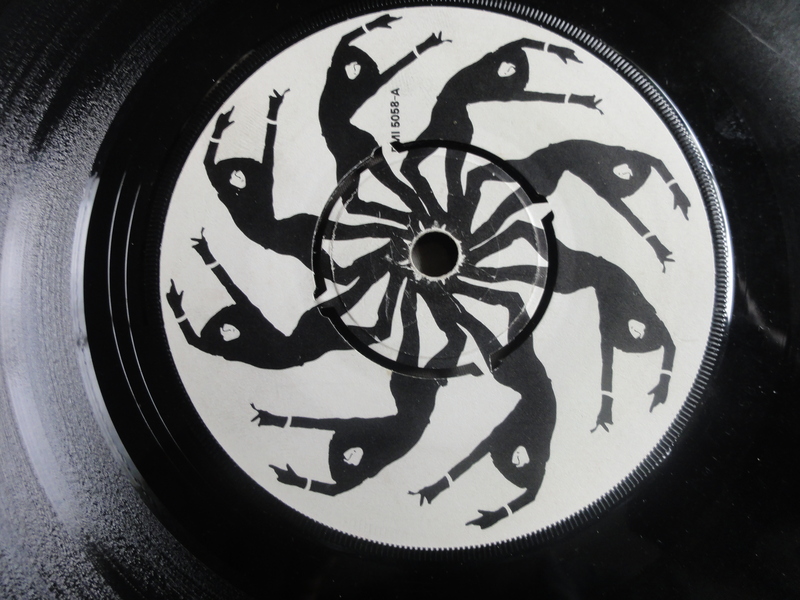 But the real selling point is the way the record features a bizarre animation of a fish-headed man jogging around the centre label. What the significance of the fish-headed man is, I have absolutely no idea, but it looks great. 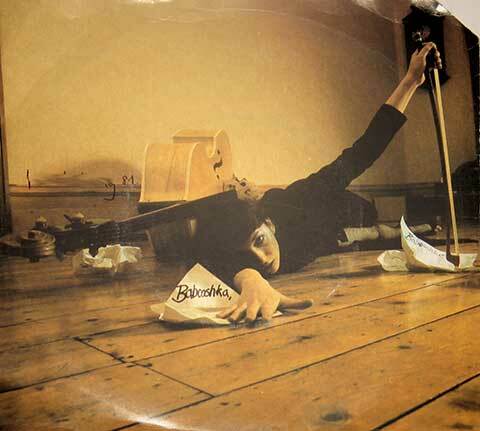 ‘Babooshka’ features some very impressive wailing by Kate and was another surefire hit for her in the summer of 1980, reaching number 5 in the UK, while also doing the business in Australia! The meaning of it once more went way over my head at the time of release, but I have since come to learn that it is about a wife’s desire to test her husband’s loyalty by inventing a desirous alter ego. I have also learnt (and get this!) that the double bass featured on the cover image, beside a dramatically floored Kate, is meant to symbolise the husband in the song – which is all very sexual, in a very dark way. The double-bass image also makes a striking appearance on the vinyl single itself, the B-side of which is another exclusive song, ‘The Ran Tan Waltz’. This is a curious track on the subject of a hard-drinking mother’s neglect of her child, from the perspective of her put-upon husband, ‘ran tan’ being Irish slang for a drunken excursion. It really is in waltz-time too, but it is not what I would call an essential track. You should, however, still own this disc, and if you were to get an especially collectable version, I would suggest the Russian blue flexidisc, at £25. Hell, I don’t even have an image of said disc, it is that rare! 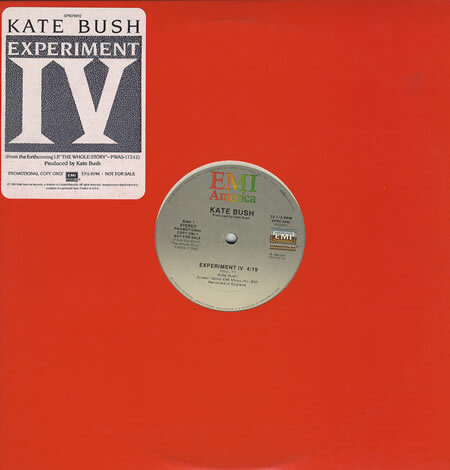 ‘Experiment IV’ is a song recorded especially for Kate’s only best-of collection, The Whole Story, in 1986, which was released as a single that reached number 23 in the UK. It’s all about the Ministry of Defence creating a ‘sound that could kill someone from a distance’, although, for all that, it is quite a normal-sounding record by Kate’s standards. In fact, I remember listening in to Peter Powell on his Radio 1 show one saturday morning in 1986, to hear his regular assemblage of precocious teenagers reviewing singles that had been released that week, one of them complaining of ‘Experiment IV’ that “it didn’t really go anywhere”. I have never really understood this idea of records “not going anywhere” (where are they supposed to go!? Kathmandu? ), but I will say that the song does seem to lack, rather sadly, the experimental vigour and vocal craziness of many of her other singles, while still being highly decent stuff, obviously. 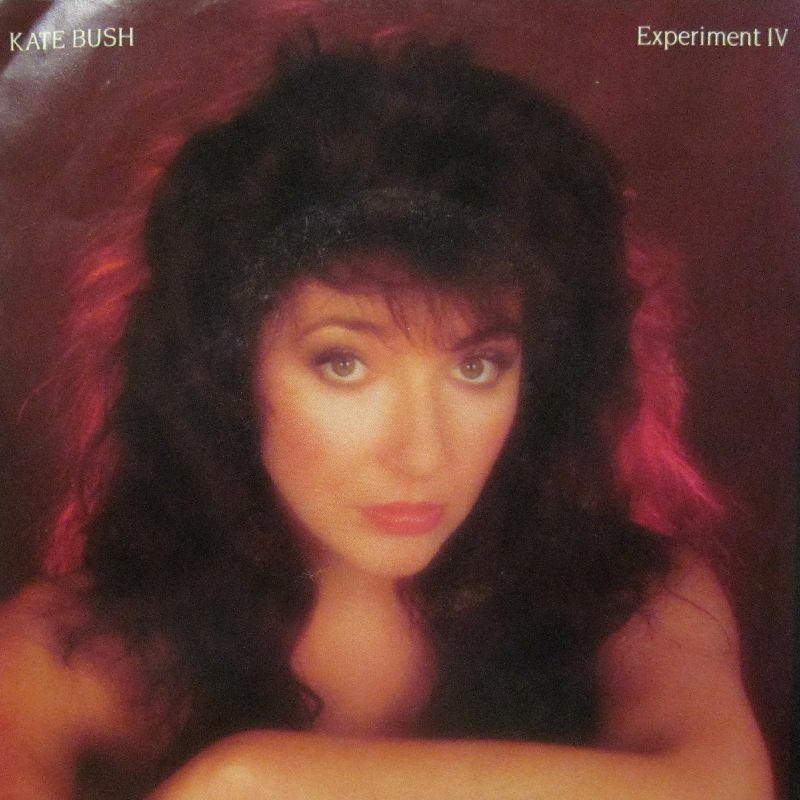 As an added bonus, ‘Experiment IV’ features a ‘new vocal’ recording of ‘Wuthering Heights’ on the B-side, though this track is of course readily available on The Whole Story. The version of the single that you really need, however, is the US promotional vinyl 12″, which is presented (as pictured) in an extremely red sleeve. 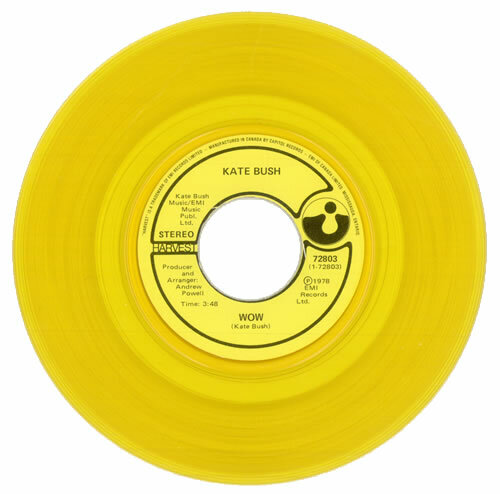 Kate Bush single ever released. The record company pushed for ‘James and the Cold Gun’ as the initial release, but the 18-year-old Kate wasn’t having any of it. As a result, we got one of the most distinctive debuts ever, with that vocal style and that freaky dancing in both the video and on Top of the Pops, while the singer, in the year of punk, decided to resurrect the characters Heathcliff and Cathy that had originally featured in Emily Bronte’s nineteenth-century novel. I have an early memory of the song being at number 1 (who couldn’t?! ), but I will admit that I didn’t fully appreciate it till I listened to it properly on The Whole Story, when I gradually realised that the first line wasn’t ‘Owl on a wiley winley mornee’, but rather ‘Out on a wild and windy moor’ (which makes much more sense). It’s an historic single, of course, but the UK pressing really isn’t too hard to come by if you are a regular at record fairs, or even your local charity emporium. Far more collectable is the rare 1978 Brazilian 7″ single, featuring a unique label with Portuguese text and ‘housed’ in a Phonogram die-cut PVC sleeve. If you see this, be impressed. Be very impressed. 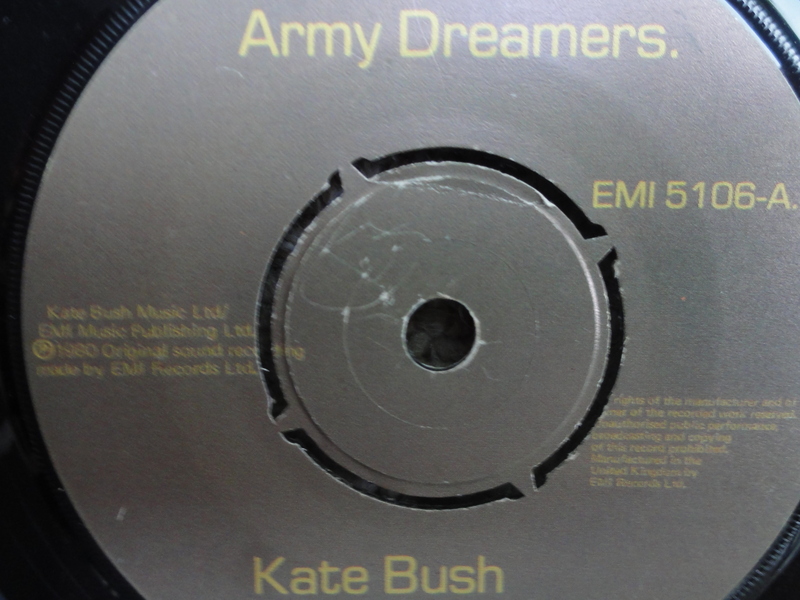 On ‘Army Dreamers’, another phenomenal single from 1980, Kate demonstrated a folk music influence in her ability to weave narratives and inhabit characters in her singing (much as The Unthanks do these days), while once more experimenting with a waltz rhythm. In the song, Kate takes on the perspective of a mother who grieves for her young adult son who has been killed on military duties (perhaps a British soldier in Northern Ireland), detailing her guilt over how she could have prevented his death. It is a very moving song, even while Kate decides to sing ‘Did-n-did-n-did-n-dum’ in the final verse. And it is surely one of the more unusual anti-war songs to have become a top 20 hit! It is also, as improbable as it may be, a particular favourite of the Bristolian trip-hop artist Tricky, who has lauded it as a track he wishes he had written. The vinyl single of ‘Army Dreamers’ makes good use of military colouring and a GI font, with a worthwhile B-side that features two tracks. One of these is ‘Delius’, an atmospheric piece that is a tribute to composer Frederick Delius (available elsewhere on the Never for Ever album). The other is a simple composition, ‘Passing Through Air’, a very early work from 1973 that is here given its first, erm, airing. It is a fairly slight song, but hey, it is only a B-side.